Now your child can take private lessons, during school hours, at times that are agreeable to parents, teachers and administrators. InSchool Music provides a doorway for your child to enter into deeper musicianship that can only be attained through one-on-one instruction. 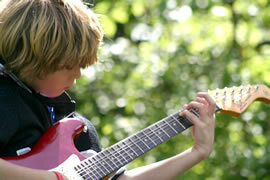 Enrich your child’s music education through private, in-school or studio music lessons. Review a complete list of InSchool Music participating schools in Western New York and learn how your child's school can participate. © 2015 InSchool Music. All Rights Reserved.